The staff of the Department consists of 32 employees (23 researchers), including 3 professors (1 habil. dr.), 11 associate professors, 3 lecturers (dr.) and 1 assistant teachers. In addition to that, there are 3 doctoral students (and 3 graduated in last 5 years) in the Department. Students pursue their studies in the following programmes: an integrated study program Pharmacy (for Lithuanian and foreign students) and an integrated study programme Pharmacy for pharmacy technicians. Upon graduation from LSMU MA Faculty of Pharmacy, students acquire the master’s degree in pharmacy (a pharmacist’s professional qualification). The Department of Pharmaceutical Technology and Social Pharmacy also provides refresher courses for pharmacy specialists. In 1922, the Faculty of Medicine of the University of Lithuania had a Division of Pharmacy, which included the Department of Pharmacy and Pharmacognosy headed by prof. P. Raudonikis. In 1944, 3 profile departments were established: 1) the Department of Pharmacy (later on renamed the Department of Pharmaceutical Chemistry); 2) the Department of Botany and Pharmacognosy (1944); and 3) the Department of Technology of Drug Forms and Galenical Preparations (1948). Prof. P. Raudonikis was assigned the head of the latter Department. He also taught the subject “Organisation of Pharmaceutical Work”. After prof. P. Raudonikis died in 1950, the Department was headed by the Candidate of Sciences in Pharmacy E. Kanopka. At that time, the staff of the Department – besides its head – consisted of only 2 assistant teachers. When in 1953 prof. K. Grybauskas died, the Department of Botany and Pharmacognosy and the Department of Technology of Drug Forms and Galenical Preparations were combined into one Department of Pharmacognosy and Technology of Drug Forms and Galenical Preparations. The number of the staff was not stable due to significant variations in the number of students of pharmacy (from 25 to 75). When the curricula changed, by the decision of the LSSR Board of the Ministry of Higher and Specialised Secondary Education, the Department was renamed the Department of Pharmacognosy and Drug Technology. At that time, the staff of the Department consisted of 2 associate professors, 3 senior teachers and 3 assistant teachers. In total, 4 subjects were taught: botany, pharmacognosy, drug technology and organisation of pharmaceutical work and economics. In 1972, assoc. prof. D. Bernatonis was elected the head of the Department. In the same year, the administration of the chemical-pharmaceutical factory “Sanitas” (director H. Dūdėnas) equipped a training laboratory for the Department in the factory premises. This laboratory provided all the necessary conditions for laboratory assignments in industrial drug technology. From 1973 on, the subject of the organisation of pharmaceutical work and economics was taught in the Department of Pharmaceutical Chemistry. In 1977, assoc. prof. E. Kaikarienė was elected the head of this Department. In 1979, the profile departments of pharmacy were reorganised into: 1) the Department of Drug Technology, Organisation of Pharmaceutical Work and Economics and 2) the Department of Pharmaceutical Chemistry and Pharmacognosy. Assoc. prof. E. Kaikarienė headed the Department until 1987. In 1987, assoc. prof. D. Bernatonis was the head of the Department. During 1987-1992, the Department was headed by prof. A. Gendrolis, and since 1992 by assoc. prof. A. Savickas. In 1990, the Department lost its training laboratory in “Sanitas”. In September 1992, the staff of the Department was complemented by some employees of the Department of Professional Development of Certified Pharmacists, also taking over its workload – refresher courses for pharmacy specialists. 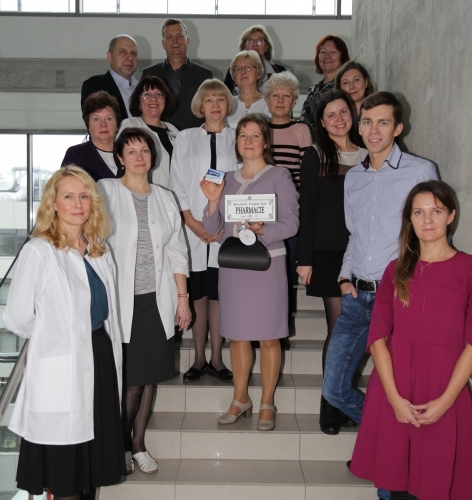 Until 1 September 1984, certified pharmacists had undergone qualification improvement in the Faculty of Pharmacy of Kaunas Medical Institute. Qualification improvement courses for certified pharmacists were headed by R. Paulauskas, A. Motiejūnas, V. Kasperavičius and V. Jasinskas. On 1 January 1985, refresher courses for physicians and certified pharmacists were introduced. Here, 2 departments were established: the Department of Electrical Stimulation and the Department for the Development of Certified Pharmacists. The latter Department had 8 teachers and 6 laboratory assistants. The employees from the Department of Drug Technology, Organisation of Pharmaceutical Work and Economics, the Department of Pharmaceutical Chemistry and Pharmacognosy and the Department of Pharmacology were also transferred to this Department. R. Pečiūra was assigned the head of this Department. The Department for the Development of Certified Pharmacists organised subject-based qualification improvement cycles for certified pharmacists – organisers, technologists and analysts. From 1989 on, the Department organised refresher courses for pharmacy technicians. In 1992, the Department for the Development of Certified Pharmacists was closed down due to financial shortages, and qualification improvement of pharmacy specialists was taken over by the Department of Drug Technology, Organisation of Pharmaceutical Work and Economics. At that time, the refresher courses for pharmacy specialists were headed by assoc. prof. L. K. Švambaris. In 1993, the Department was renamed the Department of Drug Technology and Organisation of Pharmacy. Between 1950 and 1996, the following teachers of the Department successfully defended their dissertations of Candidate of Sciences (since 1990, doctoral theses): E. Kaikarienė (1954), D. Baranauskaitė (1965), G. Pužienė (1967), D. Bernatonis (1968), V. Janulis (1978), A. Savickas (1983), H. Petkevičius (1984), R. Railaitė (1985), R. Radžiūnas (1988), V. Briedis (1990), Ž. Martinėnas (1992) and A. Baranauskas (1996). In 1987, prof. A. Gendrolis defended his doctoral (currently, habilitated doctor’s) dissertation, and, in 1995, assoc. prof. A. Savickas successfully defended his habilitation thesis, too. In 1964, on the initiative of assoc. prof. A. Kaikaris, the Department started collecting valuable items from State pharmaceutical enterprises, pharmacies and pharmacists. These items formed the basis of the Museum of Pharmacy established in 1975. Since 1979, the museum belongs to the Department and is used for the training of students. On 9 March 2005, by the Rector’s decree No. V-70 and on the basis of the decision of the Senate dated 11 February 2005, the Department was renamed from the Department of Drug Technology and Organisation of Pharmaceutical Work to the Department of Pharmaceutical Technology and Social Pharmacy. A study on the development, development of drug technology and adaptation of pharmaceutical activity to modern qualitative changes. Coordinator of the research topic: Prof. dr. Jurga Bernatonienė. 1. Influence of the technological factors on the quality of liquid and semi-liquid pharmaceutical forms. Coordinator prof. dr. J. Bernatonienė. 2. The search for pharmacologically active substances with antioxidant / prooxidant activity and the prognosis of the demand for new products. Coordinator prof. dr. D.Majienė. 3. Social Pharmacy Research and Functioning and Production of Solid forms of Medicines. Coordinator prof. habil. dr. A.Savickas. Students start studying in the Department of Pharmaceutical Technology and Social Pharmacy from their second year of studies (pharmacy technicians from the first year). Postgraduate Studies are designed for Lithuania based students who haven‘t the master’s degree in pharmacy (a pharmacist’s professional qualification). The Department of Pharmaceutical Technology and Social Pharmacy also provides refresher courses for pharmacy specialists (in Lithuanian language) and helps collect professional skills according Lithuanian Law requirements. Topics of research areas include the development of new pharmaceutical preparations and cosmetic products, the search for new formulations and technologies. Research and experimental development consists of three areas of activity: fundamental research, applied research and experimental development. Research is concentrated on developing high-quality pharmaceutical preparations and cosmetic products that are relevant to business needs and environmental benefits. The aim of the research is to determine the influence of technological properties of medicinal and botanical substances and excipients used in the production of solid, liquid and semisolid pharmaceutical forms and cosmetic products, the properties and structure of the systems formed, in support of the innovative pharmaceutical product formula and technology. Non-invasive microscopic methods are used to evaluate the innovation of developed pharmaceutical products. The introduction of advanced technologies aims to ecologize the production, promote productivity growth, which is also important for the pharmaceutical industry. One of the main ways of ecologization of production is the use of organic raw materials and the introduction of the eco-label in manufacture companies. The application of pharmaceutical care elements in pharmacy practice, analysis of drug therapy problems, analysis of ethno-pharmaceutics, old recipes and its adaptation to new pratice - the main directions of research in social pharmacy. Research on pharmaceutical care provides recomendation for improving pharmacy services and given patient requires and receives which assures safe and rational medicines usage. Ethno-pharmaceutical studies and analysis of old receptures provide insights for the creating and development of new medicines. Services provided by universities and research institutes on the basis of the VP2-1.3-ŪM-05-K instrument “Inočekiai Lt” (2014 -2015) – MITA. Technological functionalization of amber-containing cosmetic preparations (UAB Xsta-Amber). Technological functionalization of creams containing client-proposed substances (UAB The 7). Evaluation of stability of the client’s products and adjustment of the preparation formulas (MB Driu Beauty). • Technological functionalization of amber-containing cosmetic preparations (UAB Xsta-Amber). • Technological functionalization of tablets containing botanical extracts (UAB Vykom). • Technological functionalization of preparations containing proteins of an antibody fragment (UAB Profarma). • Technological functionalization of gel containing mineral water and biologically active substances (UAB Rūko karoliai).